Discover St Petersburg entertainment with our insights and have a great evening with your friends or on your own. The cultural capital of Russia offers a diverse range of entertainment to suit almost anyone. From classical Russian ballet to traditional Russian folk shows and music concerts or other performances, including sporting events, cabaret shows, and movies, or evening canal boat tours you have plenty of options to have fun. St Petersburg entertainment scene rocks as much as its nightlife. We have no doubt that after spending a day walking through the finest museums and palaces, and other historical spots in the city you will find something interesting and exciting to do any night of the week. Ready to go? If so, get out of your hotel, and start planning your evening with our guide to the city's entertainment. Click on your category of interest below, and choose. From classic to contemporary art find out where to see the best art exhibitions in St Petersburg's major art galleries and museums. Enjoy a cultural evening's entertainment of outstanding solo shows and group exhibitions offered by young and renowned artists from all over Russia. Enjoy an exciting showcase of traditional Russian folk dance and music set in an amazing neoclassical and baroque style building. Watch the famous Cossack group "Maidan", the dance group "Stars of St. Petersburg", or the folk trio "The Souvenir", and feel yourself Russian. 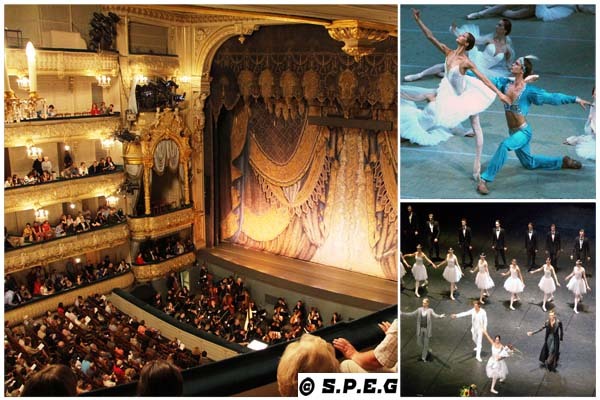 Your visit to Saint Petersburg is not complete without a stop at one of the city's beautiful opera and ballet theaters. Plan an evening going to the world famous Mariinsky Ballet Company or to the Mikhailovsky Theatre, and enjoy an unforgettable musical experience combined with an impressive mix of historic architecture and upscale ambience. From local musical groups to world-acclaimed symphony orchestras, multiple concerts take place every night in the imperial city. If you want to listen to Russian classical music and feel the ambience of 19th century noble salons, or you just want to enjoy rock, jazz, and pop music, here is a list of unmissable St Petersburg entertainment venues to go to. Fancy watching soccer in Saint Peterbsurg? Here's a list of the most important stadiums in the city as well as other sport complexes where anyone can go and enjoy a full live match of football, swimming, tennis, or even hockey in Russian style. Nothing beats the experience of seeing a classical or modern Russian movie on the wide screen, eating popcorn, while seated inside a historical theater converted into a cinema. If during your visit to the imperial city you feel like relaxing and watching a movie surrounded by an old fashioned setting, then find out where to go here.